Since Redigit stopped working on Terraria and 505 Games started work on porting it over to the Xbox & PS3, everyone pretty much considered it a finished game. Some people were bitter about the end to updates, but you can’t blame Redigit for wanting to spend some time with his family and be finished with the game – not every game gets the perpetual updates for years on end like Minecraft has. Others were bitter that the Xbox and PS3 ports were going to have some items that the PC version did not, things like pets. Most of the complaints though I take with a grain of salt – I paid somewhere around $4 for the game and have well over 200 hours invested in it. I’ve also gifted the game numerous times when it went on sale. Redigit has come out and announced a new PC update recently which has the PC community pretty excited. Included in that are at least 235 new items and some new biomes. He’s shown us a load of new screenshots (1, 2, 3, 4) and has said that this won’t be the final update to the game. He’s also stated that he’d like to make a sequel to the game once he’s finished updating it. He’s going to have a direct competitor to his game this time around though with Starbound nearing release (still unannounced), but with most people already owning the game (seriously it goes on sale for like $2) I think it’ll be more about people who already own it excited to fire it up again. I believe his sequel will also do better if he’s got an active Terraria community that he can tease with it. 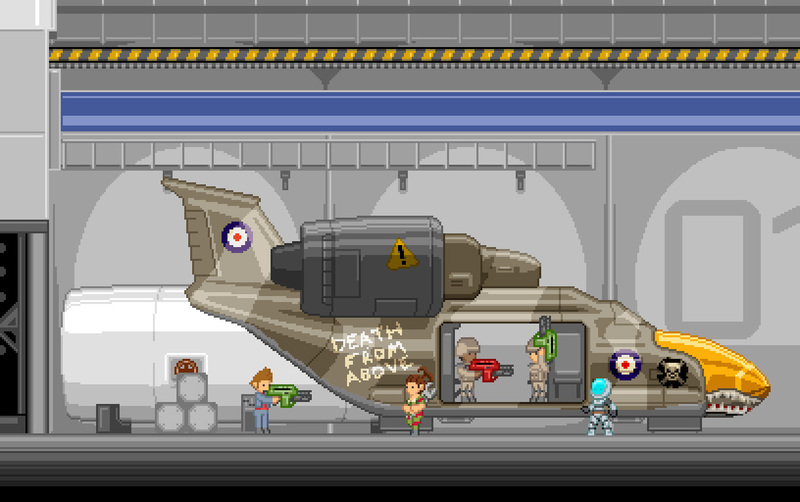 Since many of Terraria’s fanbase is sad about it’s discontinued updates with the team moving on to bigger and better things, I thought I’d share another game called Starbound that many of them will no doubt be interested in. 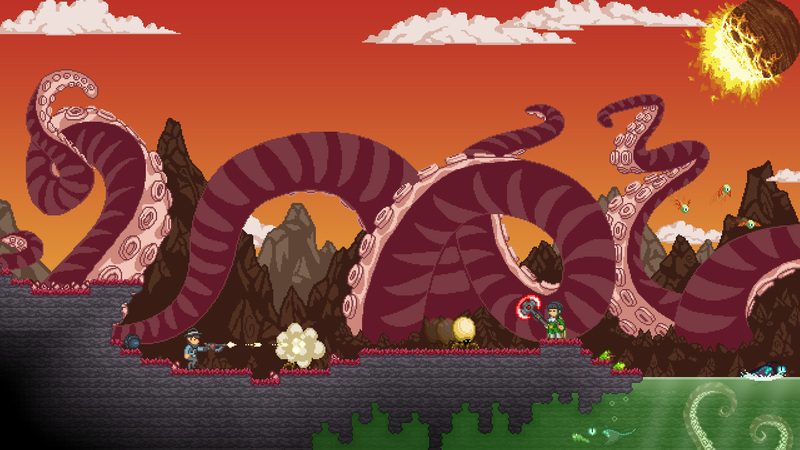 Finn Brice, the lead sprite artist for Terraria, has announced a new indie project called Starbound. The game is a 2D “sandbox RPG” with almost all the content being entirely randomized and procedurally generated. Sounds awesome, right? Yeah I know.. it is. Especially considering the quality of pixel art we got with Terraria – we can expect it to have the same if not better (from experience with a major release hit like Terraria was) artwork. Check out the game’s official website and check out some of the awesome artwork from the game. Yesterday, Redigit dropped a bomb on the Reddit community. He and the rest of the Terraria team have decided to move on. The funny thing is that games like Terraria and Minecraft have changed how we view and consume games. They’re always being updated and worked on with bug fixes and new features. Just a few years ago you’d buy a game and that was that… you get what you paid for. Now there’s a team that monitors what classes in multiplayer games are overpowered, what exploits need patching, introducing new maps and expansions. With the team’s leaving you can see the utter sense of entitlement from the community. They signed on to develop and bring you a game with a few fun updates – not a lifelong investment of new content and expansions for it. Such a feeling of entitlement… I’ve already got around 100 hours in the game and it’s been well worth the $4.99 I paid for it. The one complaint I see the most is that there’s no modding API to speak of officially, but I don’t think that’s going to keep people from enjoying the game in the future. We’re still going to run a Terraria server here on JOB until there’s been a few months where we haven’t seen anyone log on at which point we’ll decide if it’s something we want to continue to host. So long, Redigit and thanks for the amazing game and post-release content! The future of Terraria has been highly debated as of late, not just with the community, but for us as well. The last year has been a crazy ride! When I started on this game, I just had a few ideas of what I thought would make a fun game. I had no idea that it would receive so much attention. I want to thank all of you for supporting us and making this game’s success possible. After a lot of internal debate, we have decided that it is time to move on. My wife and I are due to have another boy soon, and I want to spend some time getting to know him. I also want to spend the time recharging and bettering myself as both a programmer and game designer. I have learned a lot from working on Terraria and plan on using what I’ve learned, building upon it, and moving forward with another, even better project. However, we are still planning at least one more bug fix for Terraria. For those that haven’t already heard, Finn “Tiy” Brice has moved on to form Chucklefish and is heavily at work on an exciting new game called “Starbound”. It’s looking to be a lot of fun, so make sure to check it out if you haven’t already!